A joint or articulation /articular surface is the connection made between bones in the body which link the skeletal system into a functional whole .They are constructed to allow for different degrees and types of movement and are classified by both structural design and functionailty.Some joints, such as the knee, elbow, and shoulder, are self-lubricating, almost frictionless, and are able to withstand compression and maintain heavy loads while still executing smooth and precise movements . Other joints such as sutures between the bones of the skull permit very little movement (only during birth) in order to protect the brain and the sense organs The connection between a tooth and the jawbone is also called a joint, and is described as a fibrous joint known as a gomphosis. In fibrous joints ,synarthrosis, or synarthrodial joint , the bones are joined by fibrous tissue, namely dense fibrous connective tissue, and no joint cavity is present. The amount of movement allowed depends on the length of the connective tissue fibers uniting the bones. Although a few are slightly movable, most fibrous joints are immovable. The three types of fibrous joints are sutures, syndesmoses, and gomphoses. A bar or plate of hyaline cartilage unites the bones at a synchondrosis , The most common examples of synchondroses are Temporary joints in the epiphyseal plates in children which Bind epiphysis to diaphysis and First rib attachment to sternum while Other costal cartilages joined to sternum by synovial joints. Diarthrosis, or diarthrodial joint , are those in which the articulating bones are separated by a fluid-containing joint cavity. 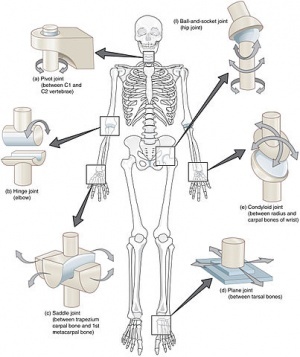 This arrangement permits substantial freedom of movement, and all synovial joints are freely movable diarthroses , they are the most structurally complex type of joints and are the most likely to develop uncomfortable and crippling dysfunction. Nearly all joints of the limbs and most joints of the body fall into this class. Although all synovial joints have structural features in common, they do not have a common structural plan. Based on the shape of their articular surfaces, which in turn determine the movements allowed, synovial joints can be classified further into six major categories ( plane, hinge, pivot, condyloid, saddle, and ball-and-socket joints ). Uniaxial Joint, the cylindrical end of one bone conforms to a trough-shaped surface on another. Motion is along a single plane and resembles that of a mechanical hinge. Uniaxial hinge joints permit flexion and extension only, typified by bending and straightening the elbow and interphalangeal joints. Uniaxial Joint , the rounded end of one bone conforms to a “sleeve” r ring composed of bone (and possibly ligaments) of another. The only movement allowed is uniaxial rotation of one bone around its own long axis. An example is the joint between the atlas and dens of the axis, which allows you to move your head from side to side to indicate “no.” Another is the proximal radioulnar joint, where the head of the radius rotates within a ringlike ligament secured to the ulna. Biaxial joints , The oval articular surface of one bone fits into a complementary depression in another . The important characteristic is that both articulating surfaces are oval. The biaxial condyloid joints permit all angular motions, that is, flexion and extension, abduction and adduction, and circumduction. The radiocarpal (wrist) joints and the metacarpophalangeal (knuckle) joints are typical condyloid joints. Multiaxial joint , In ball-and-socket joints , the sherical or hemispherical head of one bone articulates with the cuplike socket of another. These joints are multiaxial and the most freely moving synovial joints. Universal movement is allowed (that is, in all axes and planes, including rotation). The shoulder and hip joints are the only examples .